There are a lot of arbitrary lists out there giving a ‘definitive’ ranking of the best, and even worst, Best Picture winners. Some of these boil down strictly to preference. A lot take a look at the dominant field they won against. For instance, there was a big hoopla over Crash winning the Oscar in 2005 over the heavily favorited Brokeback Mountain. Especially considering it wasn’t even nominated for a Golden Globe. Then there was Shakespeare in Love‘s win over Saving Private Ryan. How could that be possible? Then there are lists that just say a year was weak and a subpar film had to walk away with the award. 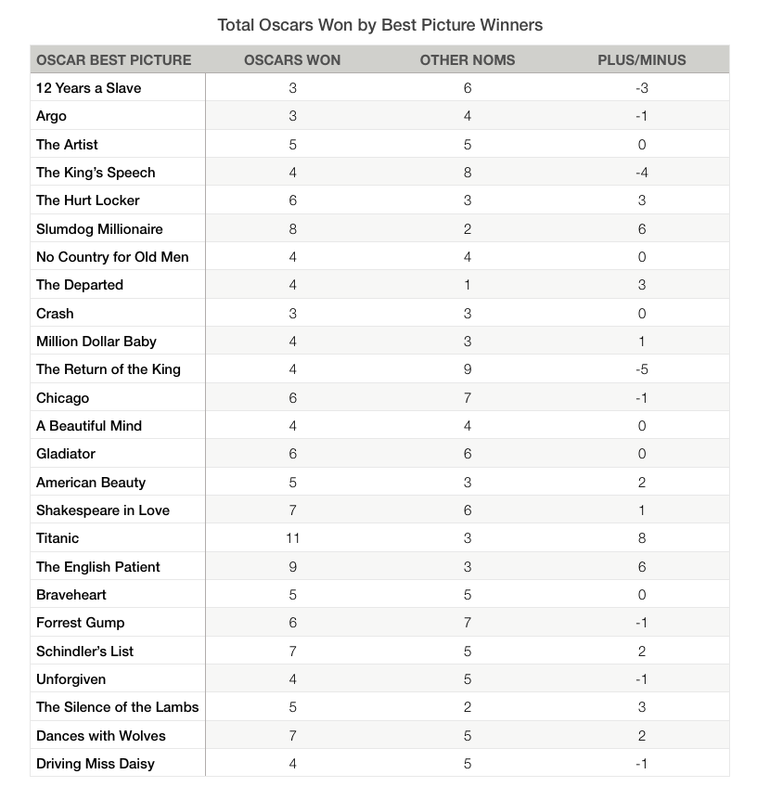 There are so many ways to give a ranking about the Best Picture winners, but I’m going to look at it by the numbers. Every year whichever film gets the most nominees becomes a focal point of the Oscar season. The most nominations means the best film, right? Well there are plenty of years where the most nominated film doesn’t walk away with Best Picture. Especially if it is a year like this year where two Best Picture frontrunners – Birdman and The Grand Budapest Hotel – lead the field with nine. So you’ll notice that the most nominations doesn’t necessarily equal Best Picture. Look at last year when American Hustle was shut out of winning despite having the most nominations. I made a series of charts looking at the past twenty five Best Picture winners. The charts include the total awards they won, including Best Picture, and how many more they were nominated for. You’ll notice the most nominations and most wins both belong to Titanic with fourteen total nominations and eleven wins. In theory Titanic could be considered the best Best Picture winner. Then there are films like The Silence of the Lambs which had seven nominations with only seven wins, but those five wins are the major five awards that only two other films swept as well (both prior to my twenty five year cut off). Maybe that’s the best Best Picture. Anyway, like I said: these lists are arbitrary, but you can take a look at the stats and decide if any of this is even worth exploring.